Hello friends, how are you? I am sure you are doing well, today I am going to share with you one of the ad network which can help you to increase your revenue, I am sure there are many of you not happy from revenue of your blog, but today here I am going to share with you about an ad network which will make you happy because this is here you are going to get good CPM rate from all over the world of traffic. 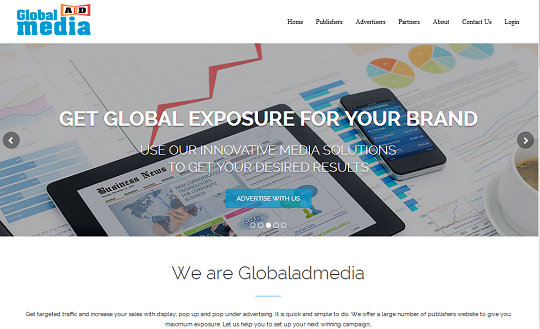 Yes, today I am talking about GlobalAdMedia, here in this article I am going to share with you each and everything about this ad network, so lets get started. If you have been reading my blog then you may be know about this section, this is a pretty special section of my review articles, so like the same here also I am going to share with you few important points about this ad network. So, here you go with all important points. You can send them request to get paid through Paypal, which platform I am using since last five years to get paid, so that means this is a recommended platform. You can get proper report of earning with traffic that is one of the cool feature of this ad network. They are doing everything to help you grow with them. This is really simple as like that, what do you think? This is one of the popular questions asked by publishers that is why I am writing here about its payment method, as may be you have read all important points about this ad network right so here I am going to share with you how you can able to get paid, there is one of the simple method they are offering that is through Paypal. Yeah, I am sure there are many of you, even all of you wanted to earn more money right. So, let me tell you one of the bitter truth that is here, if you want to earn more money then you need to write more and more quality articles with proper promotion on social media like Facebook, Twitter and even on Google Plus which will help you to get viral traffic. Find out what you can provide through your blog? what people are going to love to read and even shares with their friends? Write with dedication and then promote with all of them those already get connected with you. Have patience and keep repeating the steps you will definitely going to see growth in your earning. Yeah, this is one of the most important topic, because after all you are going to use their interface, so every publishers wants it should be so simple that's why it will quite easier for you to use and understand about it in very less time. So, for this ad network it is really simple to use, even non techie guys can easily able to understand its interface and use it. Yeah, I have to shared with you this section because here you are going to learn about what I like the most as a publisher about this ad network, that means most probably this thing will be same with you, you are publisher right, so lets go for it. 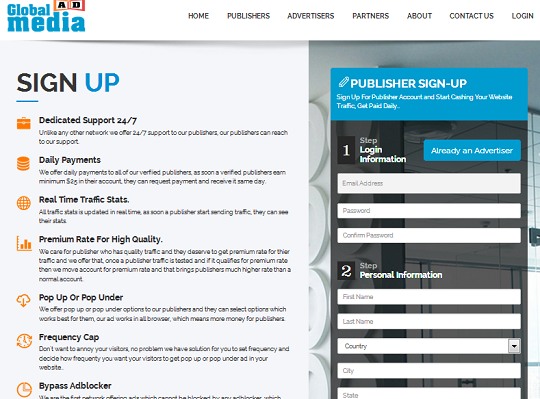 There are many publishers are not happy from their earning only because of ad network, so here you have an opportunity to start earing good revenue with same amount of traffic, which will motivate you further and of course that would be great right, so what are you waiting for start a new journey with GlobalAdMedia.com? Here, I have shared all things, what I have experienced about this ad network? what do you think let me know? Good company! I've been working with them recently, but I'm surprised by their high-quality service, quick payouts, and quick support! Always answer questions and always help! For me, Global ADMedia is the best! I advise everyone to connect to them. The best advertising network with a cat I just worked! Good support, daily payments, help 24 hours a day! I recommend. thank you very much for sharing such information here. i replace poptm with this company the rates is good and i got my first payment really very fast! let join it as soon as. That's fantastic Alex do share about your next payment please also share screen shot of it. Thanks for using PayPal. You can now ship any items. To see all the transaction details, log in to your PayPal account. Please contact us for further information or to make your thoughts known to us. Please Do Not Add Any Link to Comment, Which Will Be Count As Spam.